Please donate to the GLOBAL ONLINE CAMPAIGN by clicking here. The Global Campaign for #GIVING TUESDAY follows Black Friday and Cyber Monday and encourages charities, families, businesses, community centers, and students around the world to come together for one common purpose: to celebrate generosity and to give. The 2018 official day of giving was November 27, 2018, HOWEVER the online campaign will run through the end of the year. 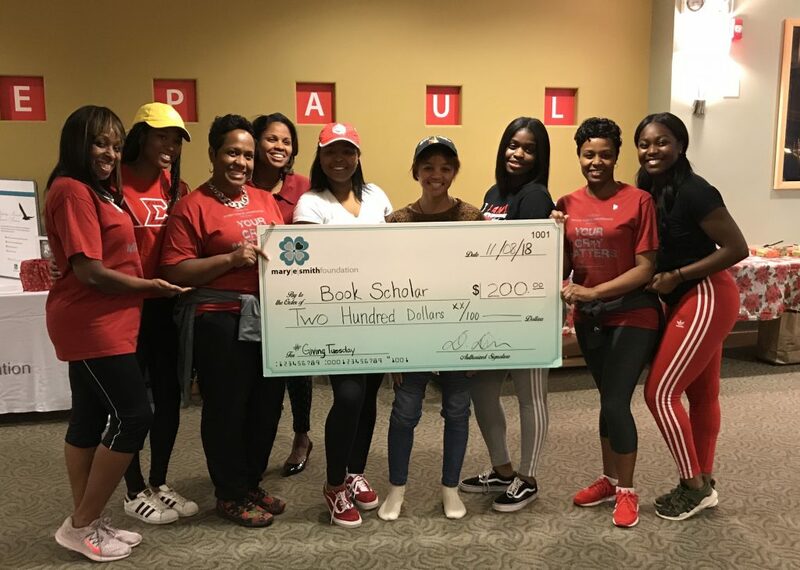 We kicked off promoting the global initiative at the beginning of November with a health & fitness brain tumor awareness event hosted in conjunction with the 2018 Community Event Partner; Upsilon Upsilon Chapter of Delta Sigma Theta Sorority, Inc. at DePaul University. The highlight of the event was an on the spot book scholarship give-a-way to a participating health science/pre-med or nursing major. Congratulations to Greer Stewart!! Our #GivingTuesday Health & Fitness Event served to kick off our scholarship & grant period. Our goal is to provide $10,000 in scholarship funds to students, along with financial grants to brain tumor patients and their families in 2019. YOU CAN HELP!!!! We encourage you to give your time, service or donations to our charity in the spirit of this global initiative. We hope that you are moved to GIVE to our charity during this critical end of year financial push. The last opportunity to support the scholarship campaign ends December 31st. We welcome any in-kind sponsorship & raffle items to support our 2018-2019 scholarship and grant programs. Visit our scholarship page for the criteria. Support the GLOBAL ONLINE CAMPAIGN by clicking here. Your financial donations are tax deductible under U.S. federal tax provisions (EIN: 26 2297602). This foundation depends on vendors, generous supporters and/or donors like you to continue our commitment to winning the fight against brain tumors. Please call 708-342-0800 if you have any questions. Mary E. Smith Foundation, Inc.